Here’s a craft that the family can do together to dress up the Thanksgiving dinner table. It’s fun and easy to do, and all your guests will be delighted with the colorful turkeys greeting them at the table! 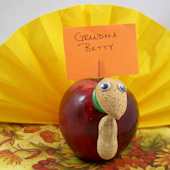 Take an apple and a festive napkin, and add some nuts and candy to make a turkey place card. One or more turkeys can also be used as a part of a table centerpiece. This project is great for family, classroom or group craft time. You and your kids can make several apple turkeys in no time. Related crafts: There are many more turkey crafts in the Fall and Thanksgiving Crafts craft series. You can make small turkeys, fancy turkeys, turkey pop-up cards and even a turkey game! Read through the project instructions and gather all of your materials. If you are doing this craft with a group, precutting the place cards and gathering the materials for each child will help the crafting process go faster. Hold the almond point down and glue two eyes on the rounded part of the almond. Let dry. Glue the LifeSavers candy to the front of the apple near the top and let dry. Next, glue the almond with eyes to the LifeSavers candy and let dry. Be sure to cover the LifeSaver hole with the almond, positioning the almond point down. Tip: If using tacky glue, you may need to hold the LifeSaver until the glue sets. Double-side foam tape is another option for attaching the LifeSaver to the apple. Glue the peanut to the apple just below the almond. This makes the turkey’s wattle. Unfold the napkin to an approximately 9-by-13-inch rectangle. Fold the napkin accordion-style. Use the paper clip to hold the fold layers together until you are ready to complete the turkey. Crease the folded napkin in the center, then bring the ends of the top layer together to make a fan. Secure the fan with a paper clip at the top. 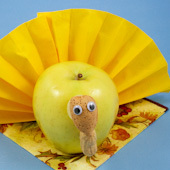 Sit the napkin behind the turkey apple. With colored paper, make a place card and write your guest’s name on it. Straighten one end of a paper clip and insert the straight end into the apple. Slide the place card into the paper clip (another option is to attach the place card to the napkin). Tip: Make the table really colorful by using different colors of apples and napkins—a yellow napkin with a red apple, an orange napkin with a yellow apple, etc. Napkins with printed designs in fall colors also work well. That's it! 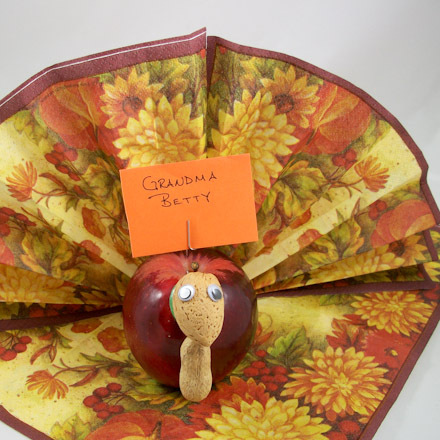 Your apple turkey place card holder is done! Thanks to Lorraine S. for sharing this project idea in Aunt Annie's Craft Exchange in 1996. Lorraine commented, "My whole family likes to do crafts and we are always looking for projects that we can do together." Tip: Use a pear instead of an apple. 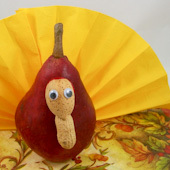 The pear shape works well for a turkey, too. Tip: Use napkins with printed designs in fall colors. 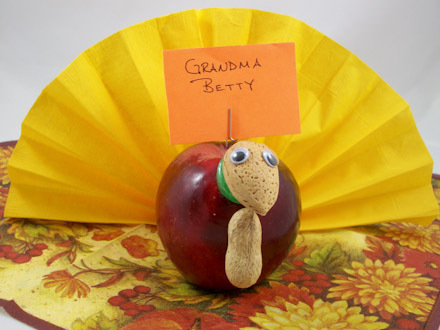 Tip: Make apple turkeys from apples of all colors!